^ Eveleth, Rose (31 March 2014). "The Definitive Guide to the Dogs on the Titanic". Smithsonian. Retrieved 17 October 2018. ^ Beveridge, Bruce; Andrews, Scott; Hall, Steve; Klistorner, Daniel (2008). Braunschweiger, Art (ed.). Titanic : the ship magnificent. Volume one: Design & construction (3rd ed.). Stroud, Gloucestershire: History Press. ISBN 978-0752446066. ^ "Titanic Conspiracies". Titanic Conspiracies | Stuff They Don't Want You to Know. 6 October 2017. Retrieved 9 October 2017. ^ Smith, Jonathan (11 September 2012). "Titanic: The Hingley Anchors". ^ a b "Titanic Owners Offer to Settle for $664,000". Fort Wayne Gazette. 18 December 1915. Retrieved 14 August 2018. 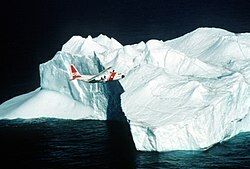 ^ a b c "Titanic Claimants to Accept $664,000; Tentative Settlement Reached by Lawyers Representing Both Sides. Some May Hold Out Prefer to Await Judge Mayer's Decision;- Suits Aggregate $16,804,112" (PDF). New York Times. 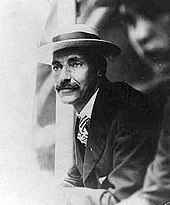 18 December 1915. Retrieved 14 August 2018. ^ Rebecca Onion (16 April 2013). 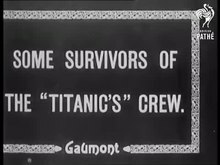 "After the Titanic, the Lawsuits". Slate.com. Retrieved 14 August 2018. ^ Paul Rogers (24 July 2009). "The Titanic and the Indifferent Stranger". 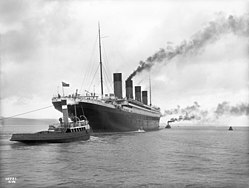 Encyclopedia-titanica.org. Retrieved 28 May 2013. ^ O'Rourke, Richard (17 October 2011). "Reducing Ireland's Oil Dependence: additional thoughts". aspoireland. Retrieved 3 February 2018. ^ a b Dawn McCarty; Jef Feeley; Chris Dixon (24 July 2018). "James Cameron: Getting Titanic Artifacts to U.K. Would Be 'a Dream'". National Geographic. Retrieved 2 September 2018. ^ Meredith, Robbie (5 October 2018). 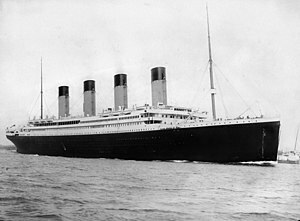 "Titanic treasure not to return to Belfast" – via www.bbc.com. 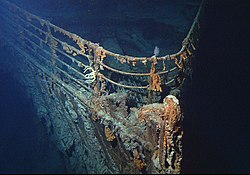 ^ "The Titanic's Artifacts Are About to Change Hands. Here's What's for Sale". Retrieved 18 October 2018. ^ Beveridge, Bruce; Andrews, Scott; Hall, Steve; Klistorner, Daniel (2009). "Chapter 1: Inception & Construction Plans". In Braunschweiger, Art (ed.). Titanic: The Ship Magnificent. I. Gloucestershire, United Kingdom: History Press. ISBN 9780752446066. Retrieved 25 May 2011. Beveridge, Bruce; Hall, Steve (2011). "Description of the ship". In Halpern, Samuel (ed.). Report into the Loss of the SS Titanic: A Centennial Reappraisal. Stroud, UK: The History Press. ISBN 978-0-7524-6210-3. 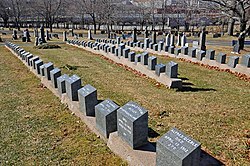 Halpern, Samuel (2011). "Account of the Ship's Journey Across the Atlantic". In Halpern, Samuel (ed.). Report into the Loss of the SS Titanic: A Centennial Reappraisal. Stroud, UK: The History Press. ISBN 978-0-7524-6210-3. Halpern, Samuel; Weeks, Charles (2011). 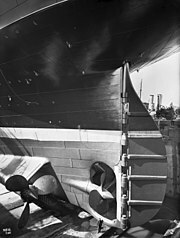 "Description of the Damage to the Ship". In Halpern, Samuel (ed.). Report into the Loss of the SS Titanic: A Centennial Reappraisal. Stroud, UK: The History Press. ISBN 978-0-7524-6210-3.